Tuesday October 21 1911 I was busy with the work all forenoon and in the afternoon went down town and took the waist Mother gave me for Christmas to Miss Harris to have made read in evening Wednesday October 25 1911 Will helped me do a big washing and I got the ironing done before supper. I read all the evening in a book. 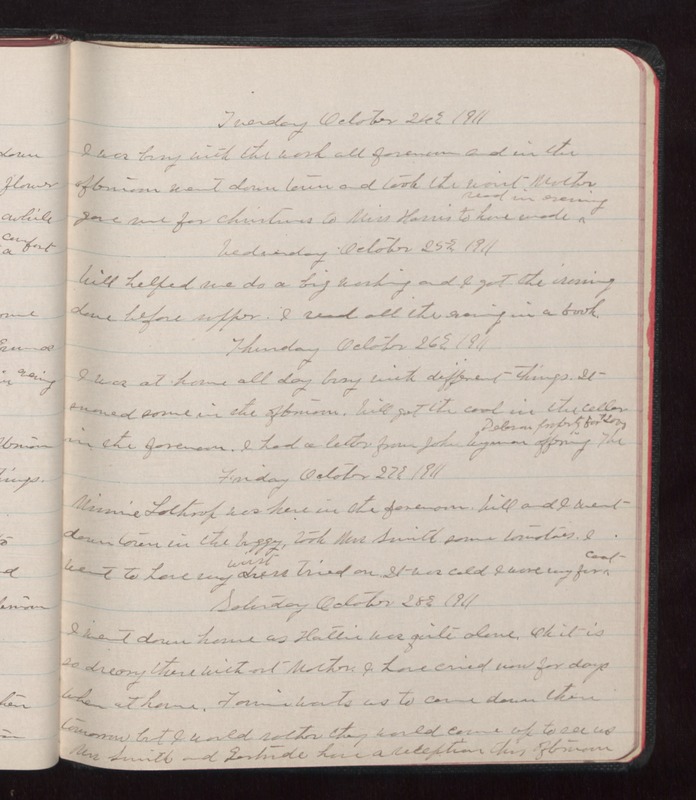 Thursday October 26 1911 I was at home all day busy with different things. It snowed some in the afternoon. Will got the coal in the cellar in the forenoon. I had a letter from John Wyman offering the [Delomar?] property for $2000. Friday October 27 1911 Minnie Lathrop was here in the afternoon. Will and I went down town in the buggy. Took Mrs Smith some tomatoes. I went to have my waist dress tried on. It was cold I wore my fur coat. Saturday October 28 1911 I went down house as Hattie was quite alone. Oh it is so dreary there without Mother. I have cried now for days when at home. Fannie wants us to come down there tomorrow but I would rather they would come up to see us Mrs Smith and Gertrude have a reception this afternoon.